We ferment in small open top bins; the cap is punched by hand. as well as extended bottle aging before release. Practices in the cellar follow the same path of minimal intervention as the vineyard. Our methods have been influenced by the science-based aesthetic of Jules Chauvet, regarded as the father of natural winemaking. 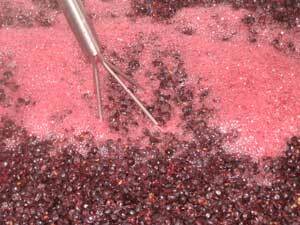 Fermentation starts gently, as native yeasts begin to work on the freshly crushed fruit. To avoid "beating up" the wine, it is never pumped into barrels, but flows downward using a gravity based system. Aging in neutral French oak barrels allows for a pure expression of the fruit and tannins, without imparting oak flavors. 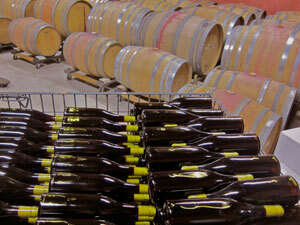 Wines are barrel aged from 3-4 years and extensively bottle aged before release. Picking only healthy balanced fruit allows us to avoid additions such as enzymes, acids or chemicals. Minimal sulphites ideally added only at bottling (unfined and unfiltered) protect the wine during the aging process. The goal is to create wines that are a pure, evocative expression of the growing site and season and have a depth of flavor and structure that can go the distance. All of our wines are ready to drink upon release, but will also develop and improve with cellaring.